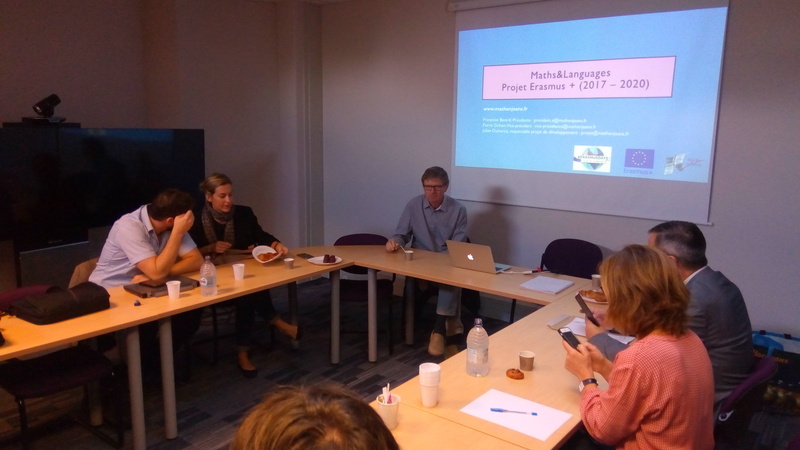 The MATh.en.JEANS association organized a dissemination meeting about the Maths&Languages project as part of the #ErasmusDays on the 13th of October in Bordeaux. Objectives: present its approach and shape to local partners: Université of Bordeaux, Espe d’Aquitaine, IREM d’Aquitaine, mathematics inspectors, DAREIC, DAAC, CLIL activities representatives and draw the contours of future collaborations. It gathered 11 people during two hours and the discussions about the M&L approach were very lively and the partnership between the project and local supports in Bordeaux is very promising. Article précédentThe M&L project started!